Happy (early) 4th of July! In addition to acknowledging America's mid-summer yumfest holiday, we would like to take this opportunity to introduce you the U.S. Synchronized Swimming Berry Olympic team. P.S. 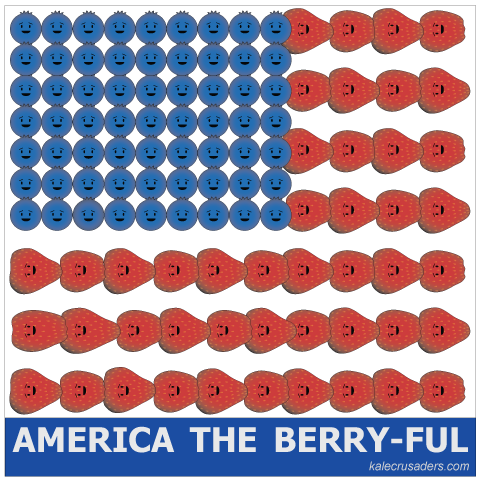 Given that this flag only has 48 stars (the whitespace between the blueberries), it would only be a valid cake between July 4, 1912 and July 3, 1959. Thanks, Wikipedia! Americans really are all just fruits (and, in some cases, fruitcakes). You ask very good questions, many of which I cannot adequately answer at this time. We will consider changing our motto to "Promoting underrepresented (and pun-worthy) foods."